Join Keyaan Williams, Senior Executive, C|CISO Programs at EC-Council for his Corporate Governance for CISOs webinar series! The third webinar in the series will cover the topic of Business Continuity Management from an executive perspective. This session focuses on the most important concerns related to business continuity management. 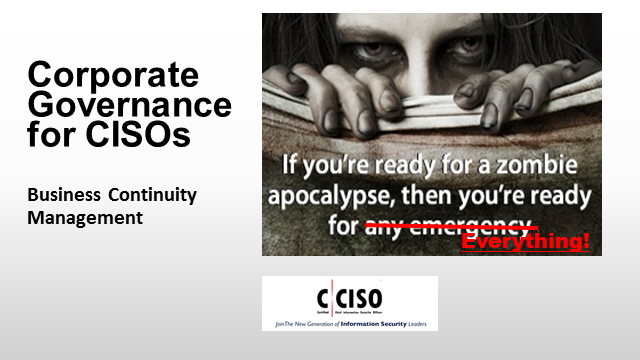 CISO isn’t always the leader of an organization’s business resilience efforts, but the CISO offers significant influence to ensure an effective program that support business impact analysis, business continuity planning, and disaster recovery for an organization’s critical information assets.